Browsing articles tagged with " x-ray"
An X-ray picture is a picture of the shadows cast by the denser materials (like bones) in your body. If the doctor suspects that you have a broken bone he will probably take an X-ray picture to check. X-rays are made of the same electromagnetic particles as light but with a much shorter wavelength. These shorter wavelengths allow X-rays to pass through the human body. X-rays are produced in a special tube. Most of the air is pumped out of the tube. The tube holds a negatively charged electrode called a cathode. Inside the cathode is a tungsten wire which will give off electrons when heated. The tube also contains an anode, or target electrode. The anode is also made of tungsten. When the electrons emitted by the cathode hit the tungsten anode they are stopped abruptly and some of their energy is turned into X-radiation. The patient is placed between an image receptor and an X-ray emitter. Originally the image receptor was a photographic plate, but there are a variety of technologies in use today. 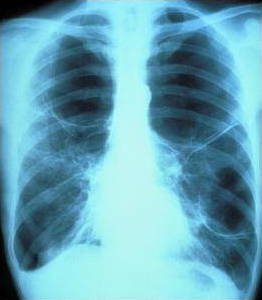 Denser parts of the body, such as bone, block more X-rays. As a result of the degree to which bone partially blocks X-rays, a corresponding negative image appears on the image receptor. A regular photograph is the product of how much and of what kind of visible light makes contact with a photographic plate; X-rays work the same way, except that they can pass through the solid matter found in the body. You would need to undress whatever part of your body needs examination. You may wear a gown to cover yourself during the exam, depending on which area is being X-rayed. You may also be asked to remove jewelry, eyeglasses and any metal objects that may obscure the X-ray image, because these objects can show up on an X-ray. Before some types of X-rays you’re given a liquid called contrast medium. Contrast mediums, such as barium and iodine, help outline a specific area of your body on the X-ray image.